My latest trawl through Seiko watches show just how this Company are climbing up the price ladder and somehow the attraction of Astron and GPS enables models isn’t as great as they’d like to think, for me at any rate. I’m of the old school and still expect that wonderful yet innovative value from Seiko as I do from the other two – Citizen and Casio and yet looking at their web site I see some unexpected prices for Seikos . . .! Seems to be a contradiction in terms through my old peepers. Take their Hi-Beat range at £5000 to £23,000 (yes I kid you not!) or their GPS Solar models from £1495 – £2995. And bear in mind that the technology used in these babies is advancing so fast that whatever you buy today will be out of date almost before you’ve got it out the box! OK I kid a little, but you know what I mean. So are they actually worth that kind of cash? Anyway I brought myself down to earth (and my blood pressure) and thought – where’s the Seiko value for money? And I came up with this – the Seiko SMY139P1 5M83 Day and Date, Kinetic movement, Ion plated and with sensible dimensions of just 41mm x 10mm and with a bracelet. Black dial, Hardlex crystal, super clarity and lovely broad full Lumibrite (Seiko) luminous hands with a sweep center seconds hand. 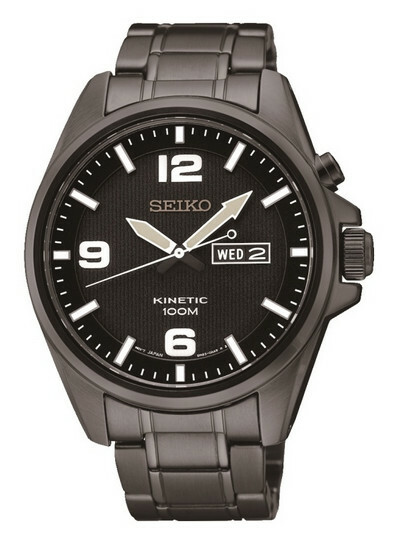 100m Water Resistant case and the classic uncluttered Seiko look. For those not familiar with Kinetic, this movement responds to the action of your wrist. It is NOT an automatic mechanical model, though it’s as close as you can get I suppose but it’s also a quartz movement. The action of wearing the watch operates a tiny electrical generator that in turn generates electricity and charges the battery. Note the battery is a special rechargeable one unlike the standard watch battery. So you buy the watch and once out the box it may or may not be ticking. If not just wave it around a few times and it will start. An idea of function is that when you wear the watch and walk for around 750m, the battery will charge and easily last about 2 days, so this gives you the idea that as you wear it, you charge it. On this model there is a discrete Power Reserve Indicator, not at first visible on the dial as you use the push button @2. Press that and the Second hand will move round clockwise to indicate certain positions. If it stops at the 5secs this denotes around 1 day, at 10secs will be around 10 days. The further it goes the higher the power reserve state of the battery. At 30secs for example the reserve is around 6 months and so on. And if really well charged and you don’t wear it for a year, take it out the drawer give it a waggle and it will start up again. Note – this is not like a digital module watch which will resume the correct time using step motors and so on, as this is purely a charging system analog watch and you will have to manually set the Day, Date and Time again in the usual manner with the crown. But what this is, is a proper value Seiko in my opinion. The technology is amazing (there is a video somewhere) and it’s all contained in a neat sized watch, which is easy to read in all light situations. It indicates the big three as I call them – that’s TIME, DATE and DAY, which for most of us is all we actually need. It can be drowned in the pool and worn under a cuff and never needs a battery, so what else do you need. It costs around £200 and there are three versions I think – This one here is the black Ion Plated version, there’s a Stainless Steel version and one with a textile strap at £20 less. I’m glad I found it as for a minute or two I thought Seiko had lost the plot!